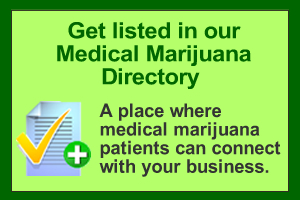 Metro Cannabis is located in an unassuming office strip that is primarily occupied by doctors. The “M C, Inc. ” on the outside sign is the only clue to its existence. Inside, the office is comfortable and professional and could easily be mistaken for a doctor’s office – except for the ATM machine in the corner, the list of “today’s strains” near the door and a large image of a marijuana plant under the name of the establishment. Owner Olga Skuratovich injects a bit of glamour into the unpretentious clinic with her French twist and high heels. She started Metro Cannabis about a year and a half ago. As a social worker working with elderly, disabled and blind clients, she saw first-hand the benefits of medical marijuana (even before it was legal) and realized the demand for it. Metro Cannabis, which has been open for about a year and a half, has already outgrown its original location in the same complex and now occupies a space of nine rooms: three private dispensing rooms (two now operational), a clone room, a massage room, a consulting room, a vendor room, the main office and an employee lounge. In addition to 50 different strains of marijuana, Metro Cannabis also sells baked goods (cookies, candy, canna-butter and more), tinctures, clones and plants (10 to 20 different strains at any given point). The clinic offers a membership plan to patients who list it as their primary caregivers, a plan which includes a discount. Ounces start at $225 for members and $250 for non-members. Membrs never pay more than $59 for top-shelf indoor strains. Skuratovich says the clinic sees anywhere from 30 to 70 people each day and that the patients come from all walks of life. She is also planning to have more offerings: acupuncture, massage therapy and perhaps even a nutritionist. But the constant shifts in the political and regulatory landscape pose a problem. Skuratovich, whose husband also owns a medical marijuana dispensary, Canna-Mart, in another area of Denver, laments that the nature of the business has changed. As far as regulating dispensaries to dampen the dizzying growth, she is ambivalent. She thinks that patients should be able to choose where and how to obtain their medicine and, from a business perspective, competition can be healthy, to a point. Metro Cannabis, 4101 E. Wesley Ave, Suite #1. Denver, Co 80222. Open 7 days a week from 11 am to 9 pm, no appointment necessary.